grievance received by oral, written or any other form of communication. 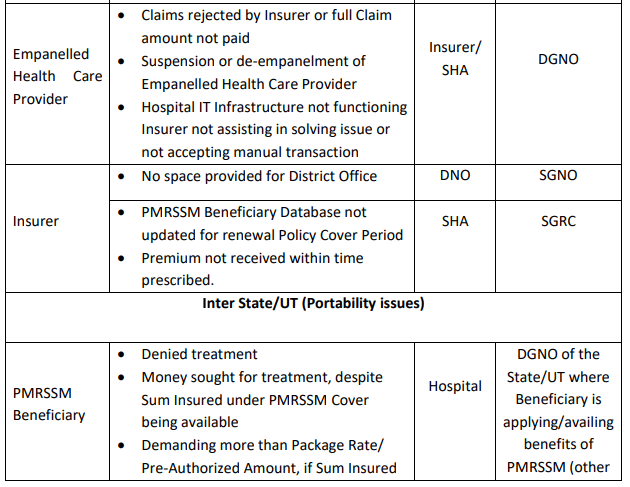 Agency (SHA) in each district within 15 days of signing of MoU with the Insurance Company. shall be the Chairperson of the DGRC.  The District Coordinator of the Insurer.  The DGRC may invite other experts for their inputs for specific cases. same within 15 days of the complaint, then the matter may be referred to DGRC. Agency within 15 days of signing of MoU with the Central Government.  Medical Superintendent of the leading state level government hospital.  The SGRC may invite other experts for their inputs on specific cases. CEO (NHA) may designate Addl. CEO (NHA) to chair the NGRC. consideration or as per the convenience of the Chairman, NGRC. within 30 days of receiving the complaint. 24 hours from the receiving of the grievance. within 30 days of receipt of appeal. within 30 days of receipt of appeal. The decision of NGRC shall be final. from the other party. The decision of NGRC shall be final. iii) Conduct grievance redressal proceedings as required. while determining the merits and demerits of a case. v) Adjudicate and issue final orders on grievances. to monitoring the turnaround time for grievance redressal. ii) Act as an Appellate Authority for appealing against the orders of the DGRC. iv) Adjudicate and issue final orders on grievances. v) Nominate District Grievance Officer (DGO) at each District. The NGRC shall act as the final Appellate Authority at the National level. i) The NGRC shall only accept appeals against the orders of the SGRC of a State. ii) The decision of NGRC will be final. 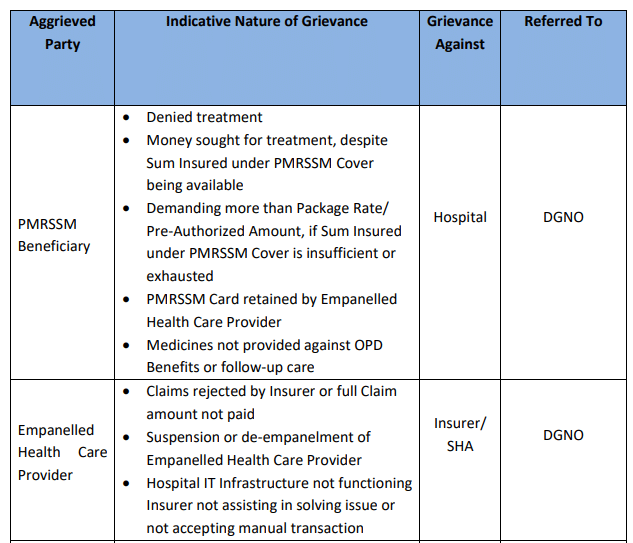 online grievance redressal portal or letter or e-mail. 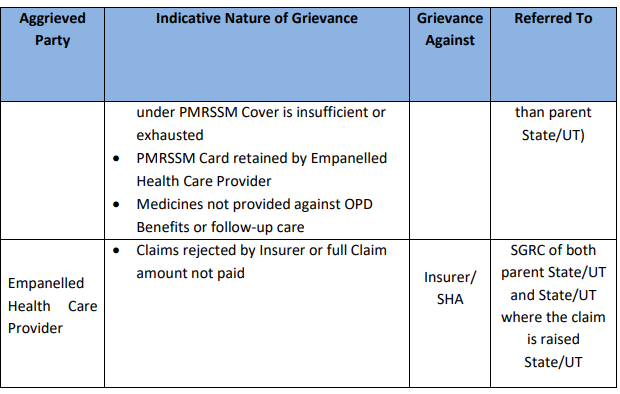 entitled to benefits under the PMRSSM Cover. ii) with the SHA: If a complaint has been lodged with the SHA, they shall forward such complaint to the concerned DGNO. with under the grievance redressal mechanism. complainant by e-mail and update the CCGMS. procedures set out shall apply. refer it to the Convenor of the relevant Grievance Redressal Committee by way of email. for a speedier resolution of the grievance. Grievance Redressal Committee shall be final and binding. having powers of appeal shall be final and binding. issuance of the order, unless such order has been stayed on appeal. penalty to the SHA within 15 days of receiving a written notice. 15 days for which such penalty amount remains unpaid. monthly report on the action taken to the NGNO. forward the same to State Grievance Nodal Officer of the State concerned.